“Le bois, vivants et organique, fixe le caractère de mes parfums” (wood, alive and organic, fixes the character of my perfumes), said Serge Lutens. Shiseido’s Féminité du Bois, the grand woody oriental scent of 1990s, was Lutens’s ode to cedarwood and the inspiration for his Les Eaux Boisées, Bois Oriental, Bois et Musc, Bois de Violette, and Bois et Fruits. These four variations of Féminité du Bois each juxtapose cedar with a different accord: vanilla, musk, violet, and fruits. Les Eaux Boisées are my favorite part of Les Salons du Palais Royal collection, and of them, Bois et Fruits is the most beloved. Bois et Fruits is available exclusively at Les Salons du Palais Royal in Paris, where it retails for EUR 100 for 75ml. 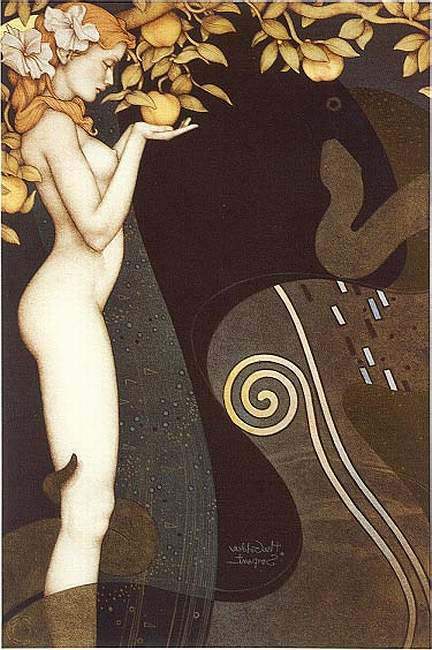 *The painting is The Golden Serpent by Michael Parkes. OMG, I *love* the image you chose. This artist is new to me, or at least with my bad memory, he is. Wow. I need to look into his work. Oh! I do know him! I worked with some of his older lithos and glicees that I recall finding vaguely interesting but nothing noteworthy at the time. Looks like his newer stuff is much more compelling, and it appears I did overlook some older pieces. Thanks for the link, M, I appreciate it. You are very welcome. That sounds like a very interesting job you had! I love the image you chose too! This is one of favourite SL perfume and though I reach for it rarely, I really enjoy it when I wear this. The other i adore is Bois de Violette. I haven't tried Bois de Violette yet. I imagine I am going to love it as much as other Boisees. So far there really was only one Lutens scent that I dind't like (La Myrrhe), his fragrance seem to work for me. Nope, not this one either, even though it is less sweet & dark. You are hard to please R, you are! :-) Is there a Boisee scent that you like? Bois de Violette maybe? My favourite is still Bois de Violette. Bois et Fruits has a tendency of turning into a huge powdery fig on some days. I still think that FdB is a much better rendition on this fruit-cedar theme. However, I have and enjoy both. This is my FAVORITE of the SL boix. Thank you for your review. I had an unmarked vial of it that I sampled in the dark depths of the Alaskan winter. I found it uplifted my mood enormously. I had to become a sleuth (read conspicuous consumer) to find out which one it was. When I made my escape to Paris, I immediately purchased the bell shaped bottle. It is divine. Sufferers of seasonal affective disorder should be prescribed Bois et Fruits. I love both too. Bois et Fruits is drier, less intense, so it is a little more versatile to me. But I couldn't live without my Feminite. Cait, this is my favourite of the Boix too! (not that I would turn down a bell jar of say Bois et Musc). I imagine scents like Bois et Fruits and Feminite de Bois, all woody orientals really, would be just the thing during the long cold Alaskan winters. You are correct. I too, love all the boix for our winter, but bois et fruits has the highest cheer quotient. Today I chose Arabie because we are adrift in snow. Thanks again, I really like your blog. Happy Thanksgiving to you too M! And thank you very much!